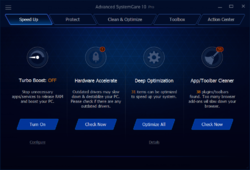 Advanced SystemCare 10 is an easy-to-use, all-in-one PC optimization utility. 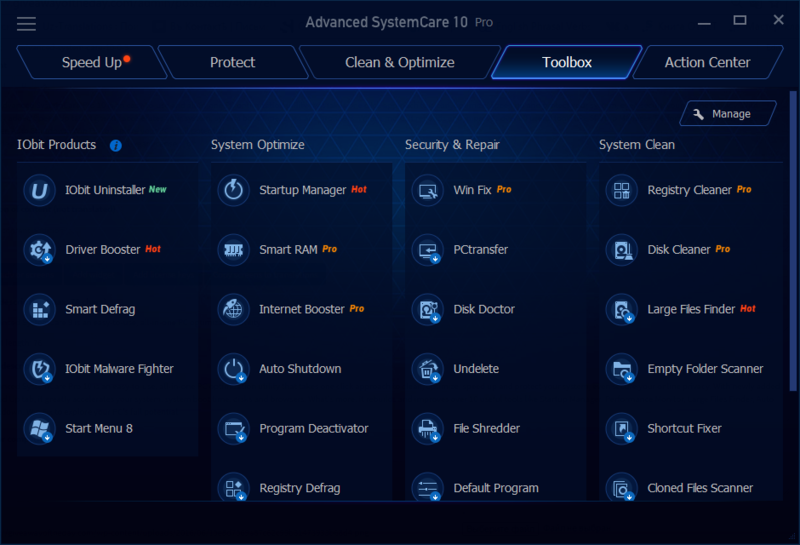 Advanced System Care Pro 10.0.3 was available as a giveaway on December 28, 2016! 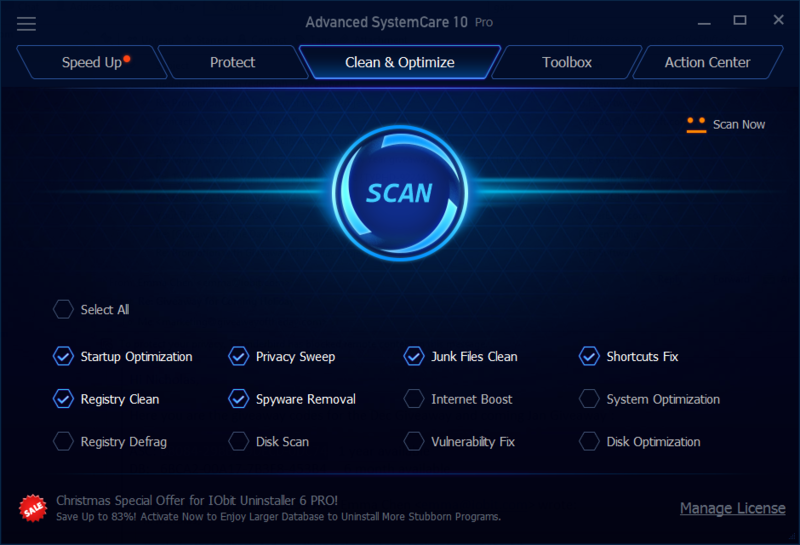 Advanced SystemCare Pro 10 is an easy-to-use and all-in-one PC optimization utility that takes one click approach to clean, optimize, speed up and protect your system, even secure your online privacy. With newly added Speed Up tab, it greatly accelerates your system, system boot time, disks and browsers. What's more, it rebuilds and improves over 10 useful tools like Startup Manager, Performance Monitor, Large Files Finder, Auto Shutdown, Win Fix to explore your PC's full potential. 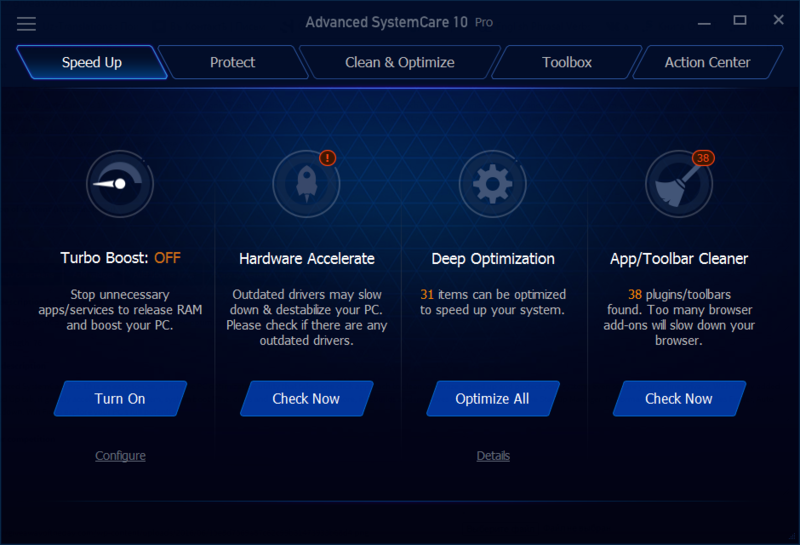 How would you improve Advanced System Care Pro 10.0.3? Increase the Largest font size. see it have the All-in-one feature removed. Let me start out by saying that IObit develops some really good programs and usually very competitively priced ($49.99? If you go to the IObit site ASC sells for $19.99 and Ultimate $29.99 and they are running a special for ASC bundled with three more popular IObit titles for under $25 - Great Deal), however, with that said I have never been an IObit fan. Why? Because even if you take IObit programs out of the Startup Que, like Microsoft, Google, Norton, IObit hides files in the OS to ensure that their programs will continue to be put in the Startup Que and be able to phone home; in other words they think that they have the right to control your computer and what happens on it. Not sure I'd have installed "Advanced System Care (ASC)" if I'd known it is an IObit program, but I did. I didn't get to install it until yesterday 31 December 2016 and since then Scotty "WinPatrol" has been continually alerting me of changes that IObit has wanted to make to my system. I will give "ASC" a fair shot and give it a try, but my gut feeling is that when it's all said and done I'll be Uninstalling "ASC" for it's continual intrusion. Let me start out by saying that IObit develops some really good programs and usually very competitively priced ($49.99? If you go to the IObit site ASC sells for $19.99 and Ultimate $29.99 and they are running a special for ASC bundled with three more popular IObit titles for under $25 - Great Deal), however, with that said I have never been an IObit fan. Why? Because even if you take IObit programs out of the Startup Que, like Microsoft, Google, Norton, IObit hides files in the OS to ensure that their programs will continue to be put in the Startup Que and be able to phone home; in other words they think that they have the right to control your computer and what happens on it. Not sure I'd have installed "Advanced System Care (ASC)" if I'd known it is an IObit program, but I did. I didn't get to install it until yesterday 31 December 2016 and since then Scotty "WinPatrol" has been continually alerting me of changes that IObit has wanted to make to my system. I will give "ASC" a fair shot and give it a try, but my gut feeling is that when it's all said and done I'll be Uninstalling "ASC" for it's continual intrusion. I was using the free version and downloaded the pro. Got an error message "Movefile failed: code "32"
Then i erased the free version and tried again. Same result. Then I tried to install the free version, same error. I was using the free version and downloaded the pro. Got an error message "Movefile failed: code "32" Installation aborted. Then i erased the free version and tried again. Same result. Then I tried to install the free version, same error. Help! Simply the best! Constantly upgraded with improvements and additional apps. Incredible the mess my system gets in just a week and how simple to retify. Well this makes a change. Last time this produce was given away it had more thumbs down than thumbs up which is not right for a good product like this one. Good to see more thumbs up this time. Trofin Petrut Eugen, you have to activate it with the key, to turn it into pro variant. Still waiting for the link to be sent to my email address after almost 16 hours. Still waiting for the link to be sent to my email address after almost 16 hours. Junk folder checked. This happens time and time again. I'm giving up on this site. Thank you Giveaway of the day!!! I've really been hoping I'd get this software for free for a decent amount of time, perhaps to check if the company and the software is worth trusting and purchasing. Now I can. Thanks a ton, and hopefully by the end of this license, I can give a good review. I finally was able to activate it. What I did was , try and reinstalling the program again (right on top of the first install9)and that led me back to the add that talks about gaining 300% more speed. Only this time under the said information was a registration area I had been looking for. Now I entered the registration code.And it worked. I will admit it took me a hell of a long time to find this. It is possible that the registration code area was there all along and I just didn't page down far enough, d but I doubt that. After seeing the comment about the tiny type 'enter code' below the activate button I downloaded the program a second time, started it up and clicked on 'enter code.' it worked, and I'm using the pro version of the program. Thanks GAOTD and ASC! HATERS & TROLLS on GAOTD are spoiling it for us who love iObit products (and other free softwares) !!! I hope the iObit Team (and GAOTD Team) keeps being kind enough to offer us free softwares in spite of the stupid backlash. James, Just downloaded via email. and shared on facebook. I do not understand how anyone is having problems with this program. When it loads read the page, there is a place to just click and enter the code you received in the readme file. You will actually need to read the readme file. Regardless of any claims by users that this program is wonderful, has been used for some number of years without incident, or other, it is meaningless without knowing the expertise each of those users have. They may be using a simple computer for simple purposes. More technical users with their own tweaks are the ones that are most leery of installing a program such as, and especially this program. I have several older computers I use to test out products such as the ASC offer, but I will not be wasting any more time on testing this company's products. Just like if you decide you don't like anchovies on your pizza, you probably will not order them on very many of your future pizza orders. 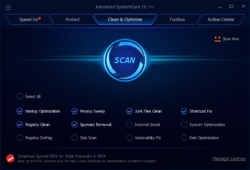 I have tested IoBit's Advanced System Care over the years ever since they first came onto the market known as Advanced Windows Care. The program has evolved, but no matter what advances the product has made, the developers have continued to make a product that pretends it is doing more good than it actually does. Here is one example. I became suspicious early on when the program claimed that it would enhance my settings for the best Internet access. Around the time that access to the Internet was becoming Broadband, the registry settings could be manipulated to handle the broadband data faster by adjusting key values for buffer sizes. Initially, tweaking forums and articles published what registry values to tweak, and what settings could improve performance. 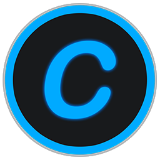 Due to many users being vary of making Registry settings manually, several tweaking programs jumped in to offer the same settings automatically. The problem was, there weren't a lot of variations on what the settings should be tweaked to, so once the settings were made, there was no need to alter them after that point. Decent tweaking programs checked for these tweaks, and did not suggest altering them since they had already been made. Therefore, when a different product informs me that those same settings need to be tweaked by their program to enhance my Internet experience, I naturally became suspicious. Advanced System Care claimed my settings were not tweaked for maximum performance, gave proof of the old values (however values that did not exist before running the program), and then claimed to make the correct adjustments, ... in order to convince me their program was doing me a favor. I also have testing tools, and no performance gains were made. What is more interesting, is that for every new release of Advanced System Care, again, the program would inform me that it needed to tweak the same settings that supposedly it had already made in the past, and magically they had reverted to poor performance settings as proof they needed tweaking. No matter how well your system is tweaked, this program pretended it needed tweaking by ASC. I tracked these changes before and after the program ran, and found that the program was straight-out lying to users, apparently hoping they will be naive users. If any technical person is interested, save a copy of your Registry before and then compare to the values after install and tweaking with this program. If it is still doing the same thing, it is proof enough that this is not the type of program you need to improve your computer. But even if it no longer does this, they have already lost favor with me, and since there are greater alternatives, there is no love lost. After the fiasco I experienced, I really started becoming suspicious of the entire company, its claims, and its testimonials. I found that others had already become suspicious as well. As far as I can tell, none of the testimonials are real people. It all appears to be marketing hype. What I did find is that by removing the program via a system restore can be the greatest performance improvement I could make. To boot, you cannot see the ads if the program is not installed to produce them. Regardless of any claims by users that this program is wonderful, has been used for some number of years without incident, or other, it is meaningless without knowing the expertise each of those users have. They may be using a simple computer for simple purposes. More technical users with their own tweaks are the ones that are most leery of installing a program such as, and especially this program. I have several older computers I use to test out products such as the ASC offer, but I will not be wasting any more time on testing this company's products. Just like if you decide you don't like anchovies on your pizza, you probably will not order them on very many of your future pizza orders. 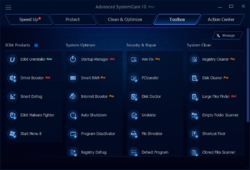 I have tested IoBit's Advanced System Care over the years ever since they first came onto the market known as Advanced Windows Care. The program has evolved, but no matter what advances the product has made, the developers have continued to make a product that pretends it is doing more good than it actually does. Here is one example. I became suspicious early on when the program claimed that it would enhance my settings for the best Internet access. Around the time that access to the Internet was becoming Broadband, the registry settings could be manipulated to handle the broadband data faster by adjusting key values for buffer sizes. Initially, tweaking forums and articles published what registry values to tweak, and what settings could improve performance. Due to many users being vary of making Registry settings manually, several tweaking programs jumped in to offer the same settings automatically. The problem was, there weren't a lot of variations on what the settings should be tweaked to, so once the settings were made, there was no need to alter them after that point. Decent tweaking programs checked for these tweaks, and did not suggest altering them since they had already been made. Therefore, when a different product informs me that those same settings need to be tweaked by their program to enhance my Internet experience, I naturally became suspicious. Advanced System Care claimed my settings were not tweaked for maximum performance, gave proof of the old values (however values that did not exist before running the program), and then claimed to make the correct adjustments, ... in order to convince me their program was doing me a favor. I also have testing tools, and no performance gains were made. What is more interesting, is that for every new release of Advanced System Care, again, the program would inform me that it needed to tweak the same settings that supposedly it had already made in the past, and magically they had reverted to poor performance settings as proof they needed tweaking. No matter how well your system is tweaked, this program pretended it needed tweaking by ASC. I tracked these changes before and after the program ran, and found that the program was straight-out lying to users, apparently hoping they will be naive users. If any technical person is interested, save a copy of your Registry before and then compare to the values after install and tweaking with this program. If it is still doing the same thing, it is proof enough that this is not the type of program you need to improve your computer. But even if it no longer does this, they have already lost favor with me, and since there are greater alternatives, there is no love lost. After the fiasco I experienced, I really started becoming suspicious of the entire company, its claims, and its testimonials. I found that others had already become suspicious as well. As far as I can tell, none of the testimonials are real people. It all appears to be marketing hype. What I did find is that by removing the program via a system restore can be the greatest performance improvement I could make. To boot, you cannot see the ads if the program is not installed to produce them. Recommended. But, while it is good, it can be a bit intrusive and naggy. I don't leave the main program running, just call it up at need, another set of tools for the toolbox. Do I assume this is only for a year? All this does is install the free version, when I click enter code in the programm it opens a webpage and offers to sell me the pro version for 14.77 dollars. No thanks. I am passing on this one only because I see that it comes with a lot of advertising and I get enough of the on the internet and don't need to add to it with programs that I install. But I am very disappointed in reading the comments I see some that have to do with the product itself but what is going on with all the members here at this site? I have belonged to this site for a very long time and have always enjoyed reading the comments and the helpfulness of the members but this time it's just disgusting! People are either throwing digs and comments at each other or making comments about the software that really have nothing to do with it and or just digs at it. I know we have all just gone through the holidays that are stressful and take there toll on a lot of us. But I really hope we can get back to what we were and where we were and that is a friendly bunch of geeks with helpful comments on the software we were being offered. This use to be one of my favorite sites that I looked forward to coming to and seeing what was offered that day and what all of us had to say about that software and I hope that we can get back there to that site. GOTD has always offered us software free of charge never bombed us with pop ups during the process and always offered us virus free software and have done the best they could. I just hope they don't get to the point of everyone saying bad things about them that they in turn say the heck with you we are offering you free software that normally costs money but why should we continue to try and help a bunch of ungrateful people? (That'snot towards everyone here on the site you know who you are and who I mean). Thanks GOTD for the offer today but like I said with all the comments about pop up advertisements with this software I'll pass! I am passing on this one only because I see that it comes with a lot of advertising and I get enough of the on the internet and don't need to add to it with programs that I install. But I am very disappointed in reading the comments I see some that have to do with the product itself but what is going on with all the members here at this site? I have belonged to this site for a very long time and have always enjoyed reading the comments and the helpfulness of the members but this time it's just disgusting! People are either throwing digs and comments at each other or making comments about the software that really have nothing to do with it and or just digs at it. I know we have all just gone through the holidays that are stressful and take there toll on a lot of us. But I really hope we can get back to what we were and where we were and that is a friendly bunch of geeks with helpful comments on the software we were being offered. This use to be one of my favorite sites that I looked forward to coming to and seeing what was offered that day and what all of us had to say about that software and I hope that we can get back there to that site. GOTD has always offered us software free of charge never bombed us with pop ups during the process and always offered us virus free software and have done the best they could. I just hope they don't get to the point of everyone saying bad things about them that they in turn say the heck with you we are offering you free software that normally costs money but why should we continue to try and help a bunch of ungrateful people? (That'snot towards everyone here on the site you know who you are and who I mean). Thanks GOTD for the offer today but like I said with all the comments about pop up advertisements with this software I'll pass! where do i activate the program? every time i click on activate it sends me to avangate where they only have the possibility of payment. yifat, If you activate it there is the serious prospect that you will use it. yifat, If you activate it there is the serious prospect that you will use it. Please dont. yifat, There will be a button at the bottom left that says enter activation code. You can get the code in the read me file. this is one of the better cleaning utilities for windows. As with any other "suite" program available, ASC from Iobit will of course off the "Standard" or "Advanced" installation options. IF you do not wish to have additional packages installed, select the Advanced option and customise your installation. ASC has 100% customization in what you want it to do or not do. If you're not proficient in what to do then by all means, DON'T. ASC is called ADVANCED System Care for a reason. If you want a tool that is simple point, click and have it do it for you, then feel free to have some other tool do it for you, but to claim this tool is a resource hog or a build killer is honestly ridiculous because it couldn't be further from the truth. I've run ASC for their last 4-5 major releases including through the beta stages before they've gone through public preview and have never had a single build get killed. Maybe I just got lucky or maybe it's my more than 30 yrs experience in I.T. so I do customize my installation to where I do not install the Driver Booster, Smart Defrag and other tools offered. Yes.......all of Iobit's apps will offer their other products just like 90% of other companies do, but how do you think they afford to give their software away for free multiple times per year? Iobit gives away every one of their products no less than 4 times per year. Customize your installations. If you have Kaspersky or god forbid Symantec (Norton), then yes......you may face some issues, but don't claim that it's Iobit that's causing issues. Kaspersky and Symantec cause issues with a lot of applications. Iobit ASC Ultimate version actually includes Bitdefender as part of the application to offer antivirus protection on top of the spyware protection already built into the application. In the end....it's simple......try it for yourself. If you like it, use it. If not, you've lost nothing because ASC DOES remove completely if you choose to uninstall it and it hasn't cost you anything considering it's free. As with any other "suite" program available, ASC from Iobit will of course off the "Standard" or "Advanced" installation options. IF you do not wish to have additional packages installed, select the Advanced option and customise your installation. ASC does NOT destroy any builds of Windows unless you're running the garbage that is Windows 8 or dare I say Vista. In that case, honestly, you deserve whatever happens to you. (Sorry, but it had to be said.) ASC has 100% customization in what you want it to do or not do. If you're not proficient in what to do then by all means, DON'T. ASC is called ADVANCED System Care for a reason. If you want a tool that is simple point, click and have it do it for you, then feel free to have some other tool do it for you, but to claim this tool is a resource hog or a build killer is honestly ridiculous because it couldn't be further from the truth. I've run ASC for their last 4-5 major releases including through the beta stages before they've gone through public preview and have never had a single build get killed. Maybe I just got lucky or maybe it's my more than 30 yrs experience in I.T. so I do customize my installation to where I do not install the Driver Booster, Smart Defrag and other tools offered. Yes.......all of Iobit's apps will offer their other products just like 90% of other companies do, but how do you think they afford to give their software away for free multiple times per year? Iobit gives away every one of their products no less than 4 times per year. Customize your installations. If you have Kaspersky or god forbid Symantec (Norton), then yes......you may face some issues, but don't claim that it's Iobit that's causing issues. Kaspersky and Symantec cause issues with a lot of applications. Iobit ASC Ultimate version actually includes Bitdefender as part of the application to offer antivirus protection on top of the spyware protection already built into the application. In the end....it's simple......try it for yourself. If you like it, use it. If not, you've lost nothing because ASC DOES remove completely if you choose to uninstall it and it hasn't cost you anything considering it's free. I've tried to download using 2 different web browsers on 2 different PC's and a tablet and in all cases the 'Get the Link' button doesn't work after i've entered my email address. Please sort this out GOTD. Great software. An invaluable tool to fight the battle online. Thanks for your fine efforts. David E Mattson, can it fight a battle for you? David E Mattson, Just wait until they blot you windows registry to 200MB more then it used to be and then post your comments. Speaking of trashing a computer, IObit are the experts. Hi there, everyone. I'm glad I always check the feedback before downloading. I didn't realize this program was from IObit. I don't suggest downloading any of their software since I myself have never tried it, but I think you can find some useful feedback about problem programs on this site. Hey, giveawayoftheday.com, wonderful site! No complaints here. Hi there, everyone. I'm glad I always check the feedback before downloading. I didn't realize this program was from IObit. Ok, here's the thing. What Richard is talking about is absolutely true. I think it's easy to continue using IObit software, thinking that the issues you're experiencing are unrelated. IObit itself doesn't harm your computer, but there seems to be some secondary partner programs (such as MoboGenie) which mysteriously end up on your computer after downloading these PC cleaner software programs. MoboGenie itself isn't strictly speaking a malware program, but it creates massive security gaps that allows any number of spy programs into your registry. It wasn't until I hit the forums that I understood why I was continually these spyware programs on my computer. I traced it back to MoboGenie, and apparently this was one of the programs I agreed to allow on my computer when I checked the 'terms and agreements' box. Now, don't quote me on that, it's been several years since I've dealt with this issue, but I suggest that you look at some of the comments on this site: http://www.shouldiremoveit.com/ I don't suggest downloading any of their software since I myself have never tried it, but I think you can find some useful feedback about problem programs on this site. Hey, giveawayoftheday.com, wonderful site! No complaints here. Have none of you ever installed software before. As always...the key is in the read me file. Read the read me file. Seriously. And for you hatters of Iobit, The best software in the world for what it does, I have never had any problems with any of their products and I use them all, except for Malware fighter cause it would be overkill with ESET. Have none of you ever installed software before. As always...the key is in the read me file. Read the read me file. Seriously. And for you hatters of Iobit, The best software in the world for what it does, I have never had any problems with any of their products and I use them all, except for Malware fighter cause it would be overkill with ESET. frank preston, Re "cannot access iobit.com web page to register." You have to enter the code into the programme running on your computer. You see the code in the readme. You do not have to register online. frank preston, Re "cannot access iobit.com web page to register." You have to enter the code into the programme running on your computer. You see the code in the readme. You do <b>not</b> have to register online. krypteller, software needs to access the internet to verify registration code, you can't register it to pro offline. But once you have activated, you can block it with firewall, it won't care. It took me longer than usual to register/upgrade. Can't remember the exact sequence but it started in Toolbox. Hate being vague but it's closer than a few of you have got. I am not getting the pro for free......why is that? Cheryl, did you enter the registration code from readme.txt file? You are getting pro for 1 year free, courtesy of IObit & GOTD, that's why. 1 year is a pretty long time, if you think about it. Cheryl, You are getting pro for 1 year free, courtesy of IObit & GOTD, that's why. 1 year is a pretty long time, if you think about it. Robert, experiation is 16/12/2017. More than the usual six months. But hey, everybody's different. Don't take my advice and see what happens. Richard Sebire, please give us more details of the problem. I have been using this program for about 8 months and have really enjoyed it. I am not very savvy on recent computer problems, so I very well could be missing something. So far, this program has played well with AVG and Glary (and several add-ons). I would like to know what to look for. Richard Sebire, Why then did you continue to use their software after the first or second failure? To have continued for a whole decade is unbelievable. d M Foley, Sometimes the situation changes for the better. But as soon as I hear IOBit I shudder. It's up to you, install what you want. But I'm more than happy with my CCleaner Proffesional thanks. It's never given me one problem. Father Richard, over a decade their "software" has destroyed many builds. If you uninstall this, then go to your program files folder, can you delete the IOBit folder? No? Even with Unlocker? It's a separate program.. This folder and its contents will remain on your drive indefinitely and apparently even report on you occasionally, as it does also seem to get larger and larger as time goes by. I like your name by the way. Richard Sebire, I have used IOBIT software for years. Both the free and paid versions of most of their programs. I have never had a problem with any of them. My systems work just fine before and after installs and many uses of them. I use the weekly clean part and it does a great job and my system has no problems, ever. Good programs and great company. Richard Sebire, i could remove iObit program files folder without Unlocker, i just confirmed my admin permissions, that's it. But, i agree, this software can destroy a system, i wouldn't recommend it to anyone, i'm content with CCleaner. Richard Sebire, if you can't delete a folder even with Unlocker, you can get some linux live CD/DVD, boot into it, open file manager, navigate to program files, find iObit folder, and delete it, nothing should stand in your way. Richard Sebire, I have used the free program for years and just got the paid version which this morning updated to 10.1 and have never ever had a problem from it and keeps the laptop running quick and smooth. Arnold Christensen, Well you have had a completely different experience than I. I haven't twisted anybody's arm to not use it, I'm just statng my opinion. And thanks for keeping it civil, if only everybody did here. Richard Sebire, I'm totally at a loss reading what yopu've written (along with the other negative comments). Currently I have three I)Bit programmes on my PC and have no problems whatsoever. I've often deleted and reinstalled the programmes (usually when upgrading) and never had any problems. Their Uninstaller programme is brilliant!!! I've used IOBit on both Win7 and Win10 systems. Richard Sebire, I'm totally at a loss reading what yopu've written (along with the other negative comments). Currently I have three I)Bit programmes on my PC and have no problems whatsoever. I've often deleted and reinstalled the programmes (usually when upgrading) and never had any problems. Their Uninstaller programme is brilliant!!! I've used IOBit on both Win7 and Win10 systems. Andy E.
Soft Maker, So classy...now I don't understand how I manage to maintain all those systems before Google!? Maybe education,or I was just lucky...I don't know.but I know from various sites,forums etc. for all kind of problems caused by using bad system optimizers.and following your ''polite'' advice I google a bit and in few minutes found (too) many bad examples regarding ASC.here is just one of many ''Warning; if you download IObit's Advanced System Care you are very likely to download with it the Yahoo Re-direct Rootkit virus. There is no indication and it's downloaded whether you download from CNet or IObit. The virus takes over all your browsers and redirects them to Yahoo. All the browser resetting in the world will not get your browsers away from Yahoo. It's very difficult to eradicate. None of the anti-virus products work. Norton Internet Security missed it and Malwarebytes, Hitman, Stinger & Spybot didn't get rid of it. If you have a System Restore prior to downloading, that might work. It did once for me. The only other way I eradicated it was to use disc imaging software and to re-install an earlier image of the disc. For me, I shall never go anywhere near ASC ever again.'' this is from PC Advisor...everybody have right for opinion! try to google definition of word Idiot before using it..and maybe one more- etiquette(noun)-the customary code of polite behavior in society or among members of a particular profession or group. Richard Sebire, If you want to delete the folder etc., make a batch file to do it at the next reboot. Couldn't you just boot off a Linux CD and delete the folder? I've never had a problem doing that. Richard Sebire, Couldn't you just boot off a Linux CD and delete the folder? I've never had a problem doing that. Richard, hornestly I could have said the same about two years ago. I love the Iobit Uninstaller. Used it a lot, come to find out my system got messed up many times where I had to re-install Windows 7 and 8.1. I learnt when I was about to move to Windows 8.0 that I was doing something wrong. Before then, I used to get very frustrated. I stopped having problems when I stopeed uninstalling everything the app found, that is, the SHARED FILES. I will scroll through the findings and ONLY removed the path(s) with the software to be installed. Since then, don't have issues with the uninstaller. Then, I thought I was doing a 'good' cleanup. Personally, I like and enjoy the Iobit softwares. Just my opinion! Ah, Richard..it appears I'm not the only one who has bad memories when it comes to Advanced System Care. First, anyone who knows me knows that I am not alarmist when it comes to software; I'm much more likely to blame the user when a problem arises, not the program. I should also state that ASC has many useful tools, which I've successfully used in the past. The problem arises from several components of the software which, used without thought, can bring your system to its knees. I've actually described it thusly when asked my opinion: ASC is like an extremely sharp knife; held the right way and with skill, you can make some quick cuts and get the job done--held the wrong way, you can cut yourself to ribbons and lie bleeding out on the ground. Sound dramatic? Not when you discover the hard way that a quick press of the "OK" button to a cavalierly presented program dialog box can result in a previously well-running Windows system being brought to its knees. The story, in case anyone's interested... About a year and a half ago, I installed ASC on my nephew's laptop (it was for a particular purpose, the exact nature of which I forget, but it may have been for the 'Uninstaller" module, which I rather like). I left the program installed, thinking it may serve some useful purpose again in the future, but completely forgot that the program has several stay-resident system "maintenance" modules which continually operate on a schedule, unless deactivated. One of these was the nightmarish "registry cleaner", a type of program I dislike very strongly (and something the smart computer user eschews on general principle). Anyway, as I'm the family "computer guy", one day my nephew called to report that his laptop "wasn't working." Since that imprecise phrase can mean virtually anything, I had him bring it over. I discovered that it was well and truly fouled up. Windows 8 took over 10 minutes to boot to the desktop, various programs failed to start when clicking on the usual icons, dozens of data files lost any association with their default program handlers, registered shell extensions were mysteriously missing, and a host of other problems. Hell, even his Minecraft mods were broken. I was quite mystified as to how a previously well-working system could be so completely decimated (I initially suspected malware, but after he got roped by some malicious drive-by downloads some five months earlier, I had plenty of prophylactic countermeasures in place and no--no virus or other malware was responsible for this mess). But after a good measure of detective work, including an interrogation of my nephew's recent computing activities, I discovered that the ever-helpful Advanced System Cleaner had a day earlier popped up a message stating that it had found "X number" (some amount in the hundreds apparently) of "junk files" and "obsolete" registry entries, and offered in its typically confident-sounding message something to the effect of "Hey, you don't want all these junk files and registry entries clogging up the works and slowing down your computer, right?...So just click here and we'll fix things up in a jiffy..." And my nephew, thinking any program his uncle had personally installed could do no harm, clicked "Yes." Later, when trying to rectify this terrible mistake, I discovered that ASC had a few more surprises in store for us. While digging around in ASC, I found the incriminating entry in its logs, where a few lines and a timestamp told me that it had performed a system "cleanup" shortly before the kid's computer went into the toilet. However, I was initially relieved to find that ASC had performed a backup (or so it claimed) of whatever files it had decided to send into oblivion. "Thank goodness!" I proclaimed, "I will reverse this massacre of Windows and restore order!" However, my relief was short-lived, and annoyance turned to fury as I discovered that the so-called backup was essentially useless. ASC could NOT restore the system to its pre-massacre--er, "cleanup"--state; whether this was due to some program deficiency or because Windows itself was too damaged, I could not ascertain. Finally, I turned to Windows' own System Restore feature. Going through the entries, I found a restore point from perhaps a week earlier. I cued this up and hit 'go', and in a few moments was greeted by a message which I had never before seen in all my years of computing on the Windows platform: "The system restore was not successful." Holy #@$%@ %@! Even the system restore components were damaged!?! At this point, my options had run out--I had no choice but to back up the kid's essential data files off-disk and turn to the manufacturer's OS restore partition for a full system refresh. I'd like to note that I consider a system-reinstall to be a draconian, last ditch effort that I've not been forced to do many times in my computing life. Even when I've been hired by clients to cure and resolve severe virus infestations, I can usually find something in my bag of tricks to get a system back to tip-top shape without going the reformat/reinstall route. Make of this story what you will. To be honest, if someone else had told it, I'd normally say "well, that's anecdotal...any program can pose a danger if misused." And that's true. But when an app blithely offers to perform system "cleanups", implying to the user that it's safe, or even warranted (evoking the imagery that it's going to be like a wonderful spring-cleaning for your computer, and afterward everything is going to be so fast and sparkling-new)--well, that's just irresponsible. I'm not wishing to bash Iobit's software; like I said, there are some useful tools in ASC. But there are also some terrible ones, some of which are masquerading as benign "maintenance" utilities. And it is made worse when you discover that you can't necessarily rely on whatever safety checks, i.e., file backups, the program supposedly implements, because--for me, at least--they failed miserably. Lastly, although the story I recounted is just one person's experience--or maybe two, my nephew's, and mine--I can sincerely say that as bad as it was for me (as the person tasked with troubleshooting and fixing the mess caused by ASC, and the many hours spent doing it), if it had happened to a less experienced computer user than I am, it could have been downright traumatic. I know many individuals who would not have been technically capable of recovering from this on their own, and at the very least they could very well be $200 poorer because they had to bring their machine to the "Geek Squad" or some other fix-it shop. Clearly, Richard Sebire has had at least one bad experience as well, and in this case I can say from experience that the gentleman is not being alarmist. Please use Advanced System Care with...well, care. At the very least, be sure to turn off any automated system 'tweaking' functions, and give careful thought to any tasks you execute which may have system-wide ramifications. Ah, Richard..it appears I'm not the only one who has bad memories when it comes to Advanced System Care. First, anyone who knows me knows that I am not alarmist when it comes to software; I'm much more likely to blame the user when a problem arises, not the program. I should also state that ASC has many useful tools, which I've successfully used in the past. The problem arises from several components of the software which, used without thought, can bring your system to its knees. I've actually described it thusly when asked my opinion: ASC is like an extremely sharp knife; held the right way and with skill, you can make some quick cuts and get the job done--held the wrong way, you can cut yourself to ribbons and lie bleeding out on the ground. Sound dramatic? Not when you discover the hard way that a quick press of the "OK" button to a cavalierly presented program dialog box can result in a previously well-running Windows system being brought to its knees. The story, in case anyone's interested... About a year and a half ago, I installed ASC on my nephew's laptop (it was for a particular purpose, the exact nature of which I forget, but it may have been for the 'Uninstaller" module, which I rather like). I left the program installed, thinking it may serve some useful purpose again in the future, but completely forgot that the program has several stay-resident system "maintenance" modules which continually operate on a schedule, unless deactivated. One of these was the nightmarish "registry cleaner", a type of program I dislike very strongly (and something the smart computer user eschews on general principle). Anyway, as I'm the family "computer guy", one day my nephew called to report that his laptop "wasn't working." Since that imprecise phrase can mean virtually anything, I had him bring it over. I discovered that it was well and truly fouled up. Windows 8 took over 10 minutes to boot to the desktop, various programs failed to start when clicking on the usual icons, dozens of data files lost any association with their default program handlers, registered shell extensions were mysteriously missing, and a host of other problems. Hell, even his Minecraft mods were broken. I was quite mystified as to how a previously well-working system could be so completely decimated (I initially suspected malware, but after he got roped by some malicious drive-by downloads some five months earlier, I had plenty of prophylactic countermeasures in place and no--no virus or other malware was responsible for this mess). But after a good measure of detective work, including an interrogation of my nephew's recent computing activities, I discovered that the ever-helpful Advanced System Cleaner had a day earlier popped up a message stating that it had found "X number" (some amount in the hundreds apparently) of "junk files" and "obsolete" registry entries, and offered in its typically confident-sounding message something to the effect of "Hey, you don't want all these junk files and registry entries clogging up the works and slowing down your computer, right?...So just click here and we'll fix things up in a jiffy..." And my nephew, thinking any program his uncle had personally installed could do no harm, clicked "Yes." Later, when trying to rectify this terrible mistake, I discovered that ASC had a few more surprises in store for us. While digging around in ASC, I found the incriminating entry in its logs, where a few lines and a timestamp told me that it had performed a system "cleanup" shortly before the kid's computer went into the toilet. However, I was initially relieved to find that ASC had performed a backup (or so it claimed) of whatever files it had decided to send into oblivion. "Thank goodness!" I proclaimed, "I will reverse this massacre of Windows and restore order!" However, my relief was short-lived, and annoyance turned to fury as I discovered that the so-called backup was essentially useless. ASC could NOT restore the system to its pre-massacre--er, "cleanup"--state; whether this was due to some program deficiency or because Windows itself was too damaged, I could not ascertain. Finally, I turned to Windows' own System Restore feature. Going through the entries, I found a restore point from perhaps a week earlier. I cued this up and hit 'go', and in a few moments was greeted by a message which I had never before seen in all my years of computing on the Windows platform: "The system restore was not successful." Holy #@$%@ &#%@! Even the system restore components were damaged!?! At this point, my options had run out--I had no choice but to back up the kid's essential data files off-disk and turn to the manufacturer's OS restore partition for a full system refresh. I'd like to note that I consider a system-reinstall to be a draconian, last ditch effort that I've not been forced to do many times in my computing life. Even when I've been hired by clients to cure and resolve severe virus infestations, I can usually find something in my bag of tricks to get a system back to tip-top shape without going the reformat/reinstall route. Make of this story what you will. To be honest, if someone else had told it, I'd normally say "well, that's anecdotal...any program can pose a danger if misused." And that's true. But when an app blithely offers to perform system "cleanups", implying to the user that it's safe, or even warranted (evoking the imagery that it's going to be like a wonderful spring-cleaning for your computer, and afterward everything is going to be so fast and sparkling-new)--well, that's just irresponsible. I'm not wishing to bash Iobit's software; like I said, <i>there are</i> some useful tools in ASC. But there are also some terrible ones, some of which are masquerading as benign "maintenance" utilities. And it is made worse when you discover that you can't necessarily rely on whatever safety checks, i.e., file backups, the program supposedly implements, because--for me, at least--they failed miserably. Lastly, although the story I recounted is just one person's experience--or maybe two, my nephew's, and mine--I can sincerely say that as bad as it was for me (as the person tasked with troubleshooting and fixing the mess caused by ASC, and the many hours spent doing it), if it had happened to a less experienced computer user than I am, it could have been downright traumatic. I know many individuals who would not have been technically capable of recovering from this on their own, and at the very least they could very well be $200 poorer because they had to bring their machine to the "Geek Squad" or some other fix-it shop. Clearly, Richard Sebire has had at least one bad experience as well, and in this case I can say from experience that the gentleman is not being alarmist. Please use Advanced System Care with...well, <em>care</em>. At the very least, be sure to turn off any automated system 'tweaking' functions, and give careful thought to any tasks you execute which may have system-wide ramifications. Stop spreading misinformation. The fact that IOBit stole proprietary data from Malwarebytes was proven. The evidence for it was laid out clearly, cogently, carefully, and in great detail by Malwarebytes. The case was made so strongly that any objective individual with more than a few functioning brain cells could see that a theft (which was in fact ongoing, at the time) had occurred. Moreover, it makes no difference that it happened in 2009. IOBit may have ceased this practice, and perhaps they've walked an honest path since then, but that it did happen is a matter of public record. Peter v Rijswijk, Stop spreading misinformation. The fact that IOBit stole proprietary data from Malwarebytes <strong><i>was</i> proven</strong>. The evidence for it was laid out clearly, cogently, carefully, and in great detail by Malwarebytes. The case was made so strongly that any objective individual with more than a few functioning brain cells could see that a theft (which was in fact ongoing, at the time) had occurred. Moreover, it makes no difference that it happened in 2009. IOBit may have ceased this practice, and perhaps they've walked an honest path since then, but that it did happen is a matter of public record. This is one wonderful application that takes care of my Cares for my PC. Thanks to you all. 353 Days equals 1 year? Is it by Chinese lunar calendar? Bohai, "353 Days equals 1 year?" I suppose it took Giveawayoftheday 12 days to publish the giveaway. Bohai, "353 Days equals 1 year?" I suppose it took Giveawayoftheday 12 days to publish the giveaway. Haven't you heard of the Twelve days of Christmas? krypteller, Haven't you heard of the Twelve days of Christmas? This software is potentially dangerous, be careful with cleaning, and it's probably an option to delete all its services from startup and Program Files. Antonio, When I installed this on my win 7 pro 64 after a short while, I kept getting messages stating windows update failed, then I noticed a lot of things went wrong. It needed a full re-install and I now would not touch it or anything from IObit. Alen, so bad! Maybe you need to try system restore first? Antonio, Maybe you need to allow windows update to install itself in your settings. Arnold Christensen, THAT is an illiterate statement. Auto Update will install any/everything if allowed to run automatically! Including the new Gabon peso value to the New Guinea time change, if you just generally let it! You ALWAYS need to look at what an update from MS is!!! I am not working for this company. Now I can say that this program is one of the best program to keep the computer up to date free of rust. I personally use this program and for years and never had any problem or issues, I also use IOBIT malware fighter, driver booster and smart defrag from the same company and they are excellent programs. Give a second chance and play with it to see all the features this program offer. Antonio, First of all, I am not working for this company. Now I can say that this program is one of the best program to keep the computer up to date free of rust. I personally use this program and for years and never had any problem or issues, I also use IOBIT malware fighter, driver booster and smart defrag from the same company and they are excellent programs. Give a second chance and play with it to see all the features this program offer. daddy, well, i believe than you never had any problems with it. It all depends on how you use its components, what i items do you choose to check in registry, or disk cleaner, what other options do you choose, and what version of Windows you're on. But i have my own reasons to dislike this software, and to consider it useless for me. And have even more reasons to not recommend it to novice users. My opinion is that it's dangerous for novices and nearly useless for pros. SS and being retired military I have Tricare for life. I do have to pay the monthly cost for medicare, about $100 but do not miss it or the same for my wife due to retirement income. Now you can tell me how do you know for sure, 100%, what each and every update contains when any of your programs wants to update. MikeOD, Not to get into delving into intelligence which in my world includes being illiterate I will clarify my statement. I have Win10 which on my laptop I finally told it to go from Win 8 and load Win 10. That proceeded to happen and finished with no problems. I then ran all my checkers which included ASC free version at that time and shut the computer down when I was finished then fired it back up and no problems and the only thing I have that update automatically is Win 10 which includes Win Defender. Nothing else unless I let it. T,he laptop is a Toshiba Sat C750-A 17.3 screen, 8 GB and 750GB HD. Intelligence: I am a 2 tour Vietnam Vet in the Armys large cargo helicopter world , I retired after 20 yrs in 78, I also am retired from Bell Helicopter after the next 20yrs in quality management there and draw SS since I was a young 62, and am well into Medicare and have no medical payment problems due to my income from 2 good retirements and SS and being retired military I have Tricare for life. I do have to pay the monthly cost for medicare, about $100 but do not miss it or the same for my wife due to retirement income. Now you can tell me how do you know for sure, 100%, what each and every update contains when any of your programs wants to update. They use the windows registries as their scratch pad, thousands of entries all over the registries and can not be removed even with Revo uninstaller. I will never install their products anymore. Using restore point after the fact is useless if you have installed new software after IOBit, you will lose them if you roll back to a clean point before the IObit installation. They use the windows registries as their scratch pad, thousands of entries all over the registries and can not be removed even with Revo uninstaller. I will never install their products anymore. Using restore point after the fact is useless if you have installed new software after IOBit, you will lose them if you roll back to a clean point before the IObit installation. Can someone please share the registration code from the readme file? The email link is broken and I don't use Facebook. This would be helpful to a lot of people. thanks! Recently iObit has got some bad rap from bundling their installers with unwanted software, but don't worry giveaway installers are always checked and clean from that stuff. For paid program way too many ads and pop ups. Uninstalled. cteq, be glad you COULD uninstall it. VERY glad. Now look at your registry! CCleaner users will gain little to no value from this software. CCleaner users will gain little to no value from this software. The license is provided for 353 days https://www.dropbox.com/s/8fx24sq1rrp4drw/system%20care%20lic.jpg?dl=0 one year is 365. I finally found the "enter code" line. It is only on one of the screens, and you have to go to that screen or you won't find it. There is no "enter code" line under the "Activate" button - so I can't activate. This is one recurring freebie I never pass up. I have other utility programs on my computer that I run regularly but I have to also run Advance System Care or my computer will run like molasses in winter after awhile. It does what no other utility program can do. DL, installation and registration a snap. Thanks IObit and Giveawayoftheday. If you do NOT want Driver Booster, you need to uncheck it at the bottom of the install screen. I click on the send to send the files to my e mail and it does nothing at all.Wont send the files to my e mail. same here, nothing in junk folder. What is registration code, that is all that is needed. same here, nothing in junk folder. What is registration code, that is all that is needed. Keld Mortensen, I have checked my spam folder nothing.For some reason giveawa of the day wont send to my e mail.it just like freezes. Fred Whalen, ALL you need, is the registration key in readme,txt file, no emails. This is their paid version. Ive been using their free version to maintain my PC for a few years now and it really does wonders to it. Imagine what the paid version could do? download is complete ... raring to go ... but can't find the registration number ? sheilah, its in the readme.txt file with the prg. TerryE, and if you are not careful you can install a host of trial software they keep popping in your face paid or not . TerryE, You are right, CCleaner and all those others are the industry standard and all. About W95, If you are right that's not a bad thing. What I like about the screenshot so far is it reminds me of those old "tweaker" programs where most windows attributes were adjustable. Sorry, if you weren't there it's hard to explain. Here, as then, you might get an opportunity to easily explore what you may not know exists. Lots of GAOTD people, myself included, have a lot of learning to do. TerryE, Wise care literally does nothing! Run the "cleaner", and then rerun it. EVERYTHING is STILL THERE! "Wise" care is snake oil! Installed, wiped out previous versions of the program. Tried to activate by clicking the activate button on the main page. I found myself on a page full of advertisements and when I clicked on the activate button for this program I was taken to a page that wanted lots of personal and credit card information. I tried several different times in case I was not doing things right, but each time ended on the page for personal and credit card information. Nowhere did I find a place to enter the activation code. After some consideration, I have decided to uninstall this program and run only Wise Care 365. Installed, wiped out previous versions of the program. Tried to activate by clicking the activate button on the main page. I found myself on a page full of advertisements and when I clicked on the activate button for this program I was taken to a page that wanted lots of personal and credit card information. I tried several different times in case I was not doing things right, but each time ended on the page for personal and credit card information. Nowhere did I find a place to enter the activation code. After some consideration, I have decided to uninstall this program and run only Wise Care 365.